As the name suggests, Hair Fall is a condition characterized by loss of hair, especially during brushing, combing and washing hair. The problem is mostly caused by poor diet, hormonal changes, genetic predisposition, and various other factors. Nonetheless, it is normal to lose up to 100 stands of hair in a day as a part of natural cycle of hair growth. It can be caused by general reasons like emotional stress, anxiety, malnutrition, local skin disorders, dermal infections etc as well as specific conditions such as Hypothyroidism and Systemic Diseases. 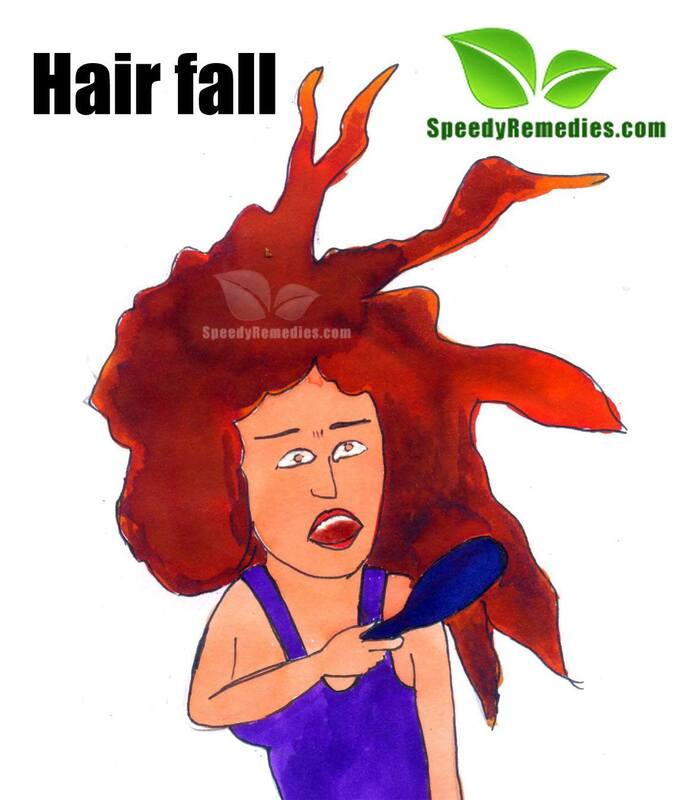 The problem can be controlled at home by following safe and inexpensive home remedies for Hair Fall natural treatment. Hair Fall can be caused by a variety of reasons like hormonal changes, genetic predisposition, aging, pregnancy, anemia, vitamin deficiencies, high intake of vitamin A, stress, excessive oil on scalp, exposure to harmful toxins present in certain hair styling products, underactive thyroid, major surgery and prolonged use of anti cholesterol drugs, antibiotics, steroids, contraceptive pills etc. Chemotherapy and radiotherapy also cause hair loss. Besides, Eczema, Psoriasis, Dandruff and fungal infections on scalp (for instance Ringworm) leading to itchy scalp can lead to Hair Fall due to persistent scratching. Acute diseases like Pneumonia, Typhoid, Systematic Diseases such as Liver Disease, Kidney Failure etc may also give rise to this problem because of decreased vitality. Using tight hair rollers and wearing pigtails can cause hair roots to weaken, thereby making hair fall out. Symptoms of Hair Fall include hair falling out in clumps and getting thinner. Patches of hair loss may be present in case of men, especially the ones prone to baldness. As the problem often leads to social embarrassment and hence low self esteem, it is beneficial to get rid of it with the help of several natural Hair Fall home remedies. • Regular scalp massages with hot oil treatments is one of the best natural home remedies for Hair Fall control. Warm coconut oil is highly recommended for this purpose as it promotes hair growth. Application of coconut milk on scalp for at least half an hour also serves as a good Hair Fall home remedy. Jojoba oil, almond oil and emu oil are also beneficial in this regard. • A combination Indian gooseberry oil and coconut oil taken in equal quantities and mixed with a tablespoon of lemon juice is an effective natural cure for Hair Fall home treatment. Apply this mixture on scalp during night time and rinse it off in the morning. Similarly, you can use a mixture prepared by boiling some pieces of Indian gooseberry fruit in half a cup of coconut oil. • Washing the hair with a decoction prepared from neem leaves works as an effective home remedy to stop Hair Fall. • Applying apple cider vinegar on scalp for about 15 minutes is useful in restoring acid-alkaline balance and hence preventing Hair Fall. • Regularly having wheatgrass juice for at least one and a half months helps reduce Hair Fall naturally. • Washing the hair with herbal decoctions like that of licorice, sage, rosemary, catnip, geranium leaves etc is helpful in getting rid of this problem in a natural way. Alternatively, you can add licorice or sage extracts in your shampoo. You can prepare a herbal infusion by boiling two tablespoons each of willow bark and burdock root in a liter of water for approximately 10 minutes and massage it on scalp about 2-3 times per week. • Applying juice extracted from green coriander leaves is a highly beneficial natural remedy for Hair Fall control. You can also drink a mixture of alfalfa juice and coriander juice. • Take some coconut oil or olive oil and fry fenugreek seeds in it. Finally, strain the mixture and apply the oil on your scalp about once in a week to stop Hair Fall naturally. • Boil 60 g of henna leaves in 259 ml of mustard oil. Cool and strain the solution. Regularly massage the scalp with this oil to prevent Hair Fall and stimulate hair growth. • Applying a homemade paste prepared by mixing some olive oil, honey and cinnamon powder for 15 minutes and then washing your hair with a mild shampoo is useful in controlling Hair Fall. • Drinking a combination of alfalfa juice mixed with equal amounts of carrot juice and lettuce juice is one of the most valuable natural home remedies for Hair Fall. Follow this therapy on daily basis to get encouraging results. • Using a combination of aloe vera gel and coconut milk on scalp for half an hour helps reduce Hair Fall and cure hair thinning problem considerably. • Prepare a paste by mixing gooseberry powder and crushed basil leaves. Apply this paste on scalp about ten minutes before washing your hair to control Hair Fall. • Drinking mustard concoction prepared by boiling a cup of water mixed with a teaspoon of mustard seeds for five minutes is highly beneficial in healing Hair Fall problem. • Washing your hair with a mixture of gram flour and curd is another useful natural way to control Hair Fall at home. • Alternative therapies like yoga, acupressure, aromatherapy etc are excellent natural remedies to control Hair Fall. When dealing with Hair Fall, it is essential to take a proper and nutritious diet consisting of a variety of fruits, vegetables, whole grains, nuts, seeds etc. Eat alfalfa sprouts asparagus, yogurt, cucumber, cabbage, beetroots, beans, spinach, soya, almonds and other such healthy foods rich in iron, protein and calcium. Apart from adopting the dietary suggestions and natural home remedies for Hair Fall, follow certain tips for controlling Hair Fall. For instance, do not comb your hair when wet, do not use hot water for washing hair, avoid using strong chemical shampoos and hair styling products, avoid using hair dryers and protect your hair from dust and sun exposure, manage stress and take adequate rest. I have done strating 1 and half years before after that i am suffering from hair loss,pl suggest me what can i use. from last one year i m suffering from hair loss,my hair greying from scalp.plz told me what i do?i have try so many things,but they are not working. from last one year i m suffering from hair loss,my hair greying from scalp.plz told me what i do? my hair get lost from scalp. Wash your hair with onion water. Get your tresses to be super sleek and shiny while supplementing them with nutrients by rinsing your hair with onion water. Cut up an onion and boil it in several cups of water. Allow the onion water to cool, strain out the onion, and pour it through your hair. Massage it into your scalp before rinsing the onion water out again. Rinse your hair with apple cider vinegar. Among the multitude of uses for apple cider vinegar is increasing hair growth through frequent rinsings. After you finish shampooing your hair in the shower, rinse it out with apple cider vinegar. Follow with your regular conditioner and rinse with warm water. Try a grapeseed oil massage. This lovely oil is often an ingredient in popular hair care products, and can be used on its own to increase hair growth. Pour some oil (room temperature or warm) onto your scalp and massage it in with your fingers. Allow it to set for up to an hour. Do this 2-3 nights a week for the best results. Add a bit of palm oil to your strands. Rather than focusing on the scalp, adding palm oil to the length of your strands will increase its vitality and prevent it from breaking. Thoroughly coat the ends and middle sections of your hair with palm oil, and allow it to soak in for 10 minutes. Rinse it out with your regular washing routine as you normally would. Doing this 2 times a week for several months will keep your hair stronger over time. Switch over to silk pillow covers. Pillowcases made from cotton or linen, although may feel soft, are rough enough to grab strands of hair and cause unnecessary breakage. Prevent this from happening by simply switching to a silk pillowcase. It will stop unwanted friction on your hair while you sleep, and is extra comfortable for heading to bed. Most importantly use Ayurvedic Kesh King Hair loss therapy regularly.